This is the reverse of the advert. Disease and illness were feared by those living in the 19th century. Anaesthetics were not discovered until the 1840s and they were not commonly used until the end of the century; those living in cities were malnourished and diseases like tuberculosis were widespread. This fear of illness was exploited by charlatans and medicines like Dr. John Hamilton’s Phospherous Treatment, featured in this advert, were common. 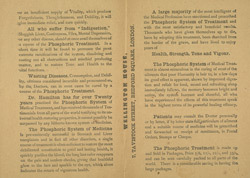 This particular treatment is advertised as helping to cure a range of ills from forgetfullness and mental depression to indigestion and piles. It even claims to help ‘loss of brain power’.